Top Carpeting with an Area Rug! by kathyregini | Comments Off on Top Carpeting with an Area Rug! If you have wall to wall carpeting, try layering an area rug on top. I know…I know…sounds strange. It’s a little tricky to pull off, but trust me when I say the results are worth it when it’s done right. 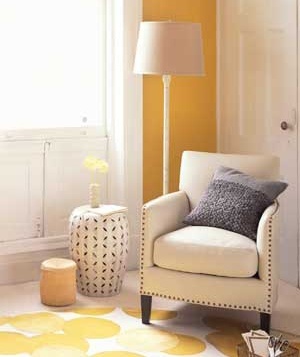 Layering rugs, like layering clothes, adds texture, color and dimension. It also defines spaces (like a sitting area) and anchors furnishings. The idea works best with a tightly woven, low pile carpet in a solid tone. Also, choose a rug that is complimentary in color to the carpet. It does NOT work well with shag or high pile, thick carpets. The area rug may not lay flat and also moves around. Plus it just looks funny. Also, if you have wood floors, you can layer area rugs on top of one another.